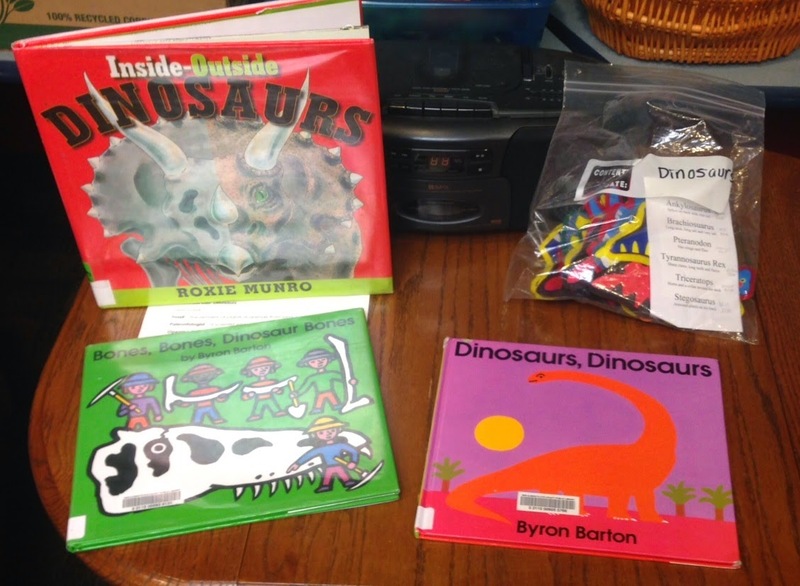 Last week in Preschool Lab, we had big fun talking about dinosaurs. Book: Bones, Bones, Dinosaur Bones by Byron Barton. We talked about scientists who search for dinosaur bones, the tools they use, and where the bones go. Book: Dinosaurs, Dinosaurs by Byron Barton. I maybe didn't need this book, but it was a nice, simple one to talk about the dinosaurs we had already learned. It also shows that dinosaurs hatch from eggs. Closing Song: Do You Know What Time It Is? Before the closing song, I let them know that I am all out of stories and I explain the stations so parents (if they are listening) will have some ideas about what to do. I encourage them to check out some books and take a packet home. Then we sing our closing song and go to stations. Mud Dough. Miss A had this leftover from the previous week's play dough program. 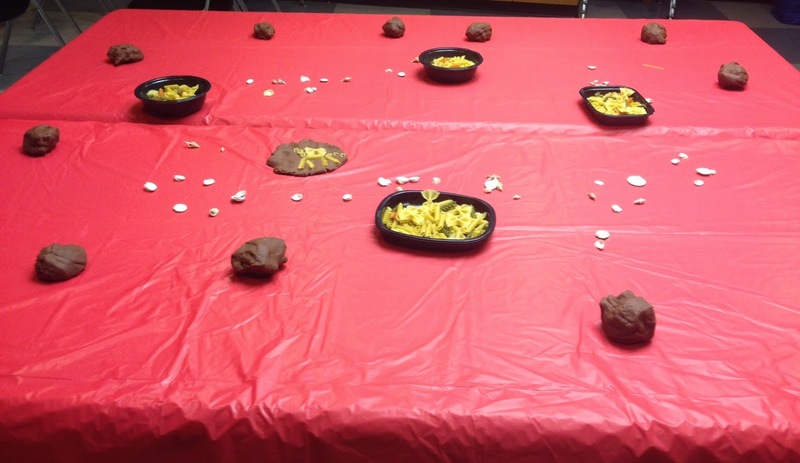 I put out this brown play dough with pasta and shells. They could use the pasta to make a dinosaur skeleton, experiment with making prints, or use the play dough to form a dinosaur. They had lots of fun with this station and it's a great sensory experience, even if their creations didn't have anything to do with dinosaurs (most of them didn't). Dino Footprint. We got this activity from the American Museum of Natural History: How Big Were the Dinosaurs? One of my librarians used it for a dinosaur program last summer and I recreated it. I asked Miss T to cut out a dinosaur footprint from our bulletin board paper. The shape is approximate and it measures 4 feet long by 2 feet wide. 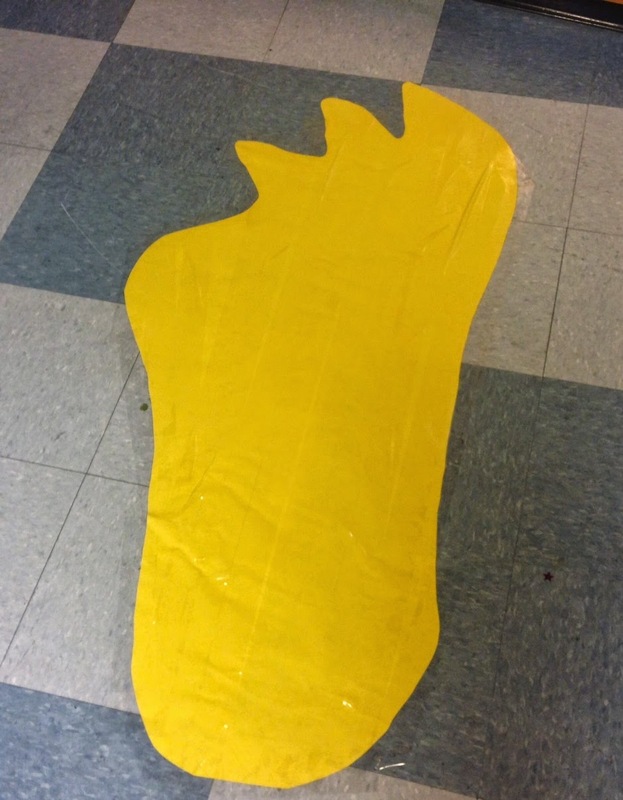 I taped it to the floor with tons of packing tape and then posted a sign inviting kids to walk across and count how many of their steps would fit inside this dinosaur footprint. 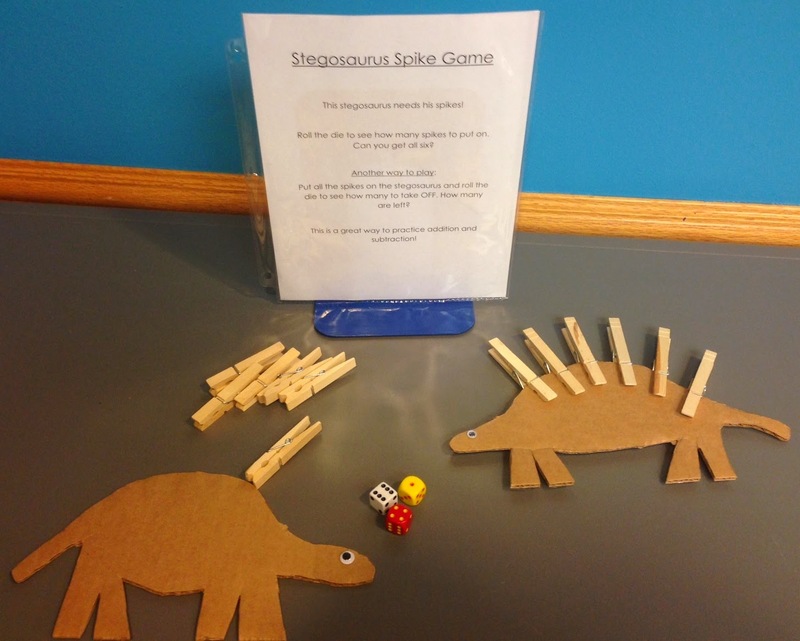 Stegosaurus Spike Game. I found this activity on the blog Sorting Sprinkles, via Pinterest. Kids roll a die and put that many spikes on their stegosaurus. This is a good activity for practicing counting, and pinching the clothespins is a great activity to build fine muscle control. Toys & Felt Board. We have some dinosaur toys with the toys we use for Toddler Time and I put out our dinosaur set on the felt board for kids to explore. And, of course, I put out a book display and take-home packets! I may rethink the take-home packets after this summer because it seems like only half of them are getting taken each week. We'll soon be planning our fall storytime sessions and that may be something we eliminate. While it's great to give them something to take home, it's fairly staff-intensive to put them together. Maybe we can do without!